Convenience and Comfort. The best value from the #1 company in salt chlorination. Forget about mixing, measuring or messing around with liquid or tablet chlorine. Say goodbye to red eyes, itchy skin and heavy chemical odors. Now there's an easier, more effi cient and cost-effective way to satisfy 100% of your pool and spa sanitization needs – and enjoy water that's always clean, clear and luxuriously soft. 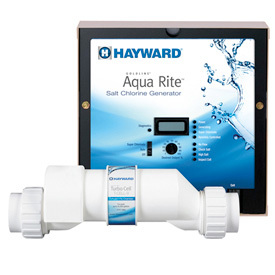 More Hayward ® salt chlorination systems have been installed in the U.S. than any two other manufacturers combined. Look for genuine Hayward salt chlorination – the #1 brand people trust. Less maintenance... Never store buckets of chlorine again! Hayward's AquaRite salt chlorinator is the convenient alternative to conventional chlorine – bringing your pool the very best in soft, silky water with no more red eyes, itchy skin or harsh odors. It's remarkably convenient, too, automatically delivering salt chlorine for the ultimate swimming experience. And AquaRite is independently certifi ed by the National Sanitation Foundation. With the industry's best warranty support, plus 50% or more savings over conventional chlorine, no wonder it's the World's #1 salt chlorinator today. NO MORE HANDLING & STORING CHLORINE FOR YOUR SWIMMING POOL!